My passion for horses goes as far back as the 1950s when the French film “Crin blanche” was first shown on British television. It was the tale of a small boy’s communion with the white horses of the Camargue. To me it signified beauty and freedom, and I longed to have a horse of my own. At the age of 16 my dream became a reality. Sadly, a lot of apprehension and a lack of knowledge spoilt what I had for so long wished. This experience shattered any further equine dreams until much later in life when I took on the guardianship of two native ponies and realised just how special horse/human relationships can be. Horses, like all animals, are our teachers. It is, however, our failure to understand their language that makes us bad students. It is a language that often transcends verbal and body cues. It is the intuitive language of love and trust that is passed between two sentient beings. A successful horse/human relationship is one based on a mutual trust and respect that is of benefit to both participants. There is a saying “that a horse can smell fear in a rider”. In a certain sense, this may be true, but whether it has anything to do with the olfactory process has yet to be confirmed. Indications of fear are evident when certain changes occur to voice, body language and heart rates. 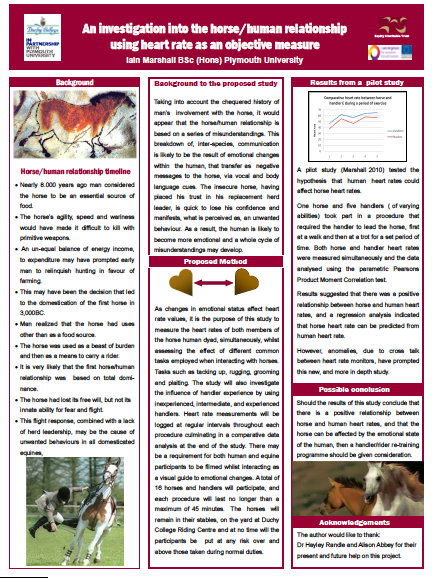 Fear is the main stimulus to trigger the horse’s flight response, which is perceived as the cause of most behavioural problems in domesticated horses. Without this ability for flight, however, the horse would never have survived in the wild state. Although not having lived in the wild for a very long time, the horse still instinctively looks for a herd leader to pinpoint danger and press the flight button. The leaders (usually mares) were the eyes and ears of the herd. If the alpha mare expressed fear then the whole herd relocated at high speed. In the absence of an equine leader the domesticated horse will automatically place its trust, and survival, in the hands of a human replacement. It is, therefore, the human’s responsibility to uphold that trust, and not confuse the horse with mixed messages based on out of control human emotions. Humans are a very emotional species. We are responsible for all types of wonderful artistic endeavours, and use our incredible imaginations to create work that we hope will be appreciated by other humans. In the majority of cases our lives are not just based on a struggle to survive. We believe that what separates us from other animals is our appreciation of the higher aspects of life, such as art, philosophy, music, religion and spirituality. It has also been suggested that the main difference between horses and humans is that the horse is not aware of its own mortality. This is a rash statement that may prove that, among other differences, the human has a narrow minded perspective of the cognitive abilities and spirituality of other species. Sadly fear would seem to be the one common denominator that we can at least be sure of. Sadly, because a relationship based on fear is no relationship at all. With our over-active imaginations and enhanced visual recall we unconsciously set the stage for something untoward to happen, and it very often does. Our fear responses are more likely to be triggered by past events than present ones. But it is the post traumatic stresses of the past that create the traumas of the present and often the traumas of the future. Every rider has at least one bad experience with horses. If these re-called experiences are allowed to surface they will intervene in any present and future horse/human relationships. The Zen philosophy of being in the moment is aptly appropriate to the way we should be with horses. In the same space and at the same moment, without any emotional baggage, is all that is required. Every moment should be taken for what it is and what it can become. It would appear that our present day concerns with health and safety are seriously affecting the way in which we experience our horses. We are in an age where people will (at the drop of a hat) resort to litigation over the smallest injury. Horse riding is seen to be one of the most dangerous leisure pursuits, and public liability insurances for riding stables have become exceedingly high. As a consequence, the industry has created a variety of safety equipment to protect us from the inevitable horse riding accident. This preoccupation is helping to set the emotional stage for us, and is preventing us from having a mutual symbiosis with our horses, because of fear. Of course, it is blatantly obvious to us that when it comes to size, the horse has a distinct advantage. This is when the WHAT IF demon raises its ugly little head and we are bombarded with gruesome images of what this creature can do to us. Once these thoughts have flashed into our minds, the horse will react to the fear it perceives in its leader and will more than likely manifest an unwanted behaviour. It was said that the Picts were so fearless that they would go into battle naked. The same was also said of the Spartans. I do not suggest that we are intending to do battle with our equines (far from it), or remove our clothes, but it highlights the fact that these warriors were not just physically strong but also strong in the mind. To the indigenous horseman, a strong horse/human relationship is as natural as breathing. They have no body armour and no fear because the horse has always been an extension of themselves. They appear to achieve a state of ONE MIND. 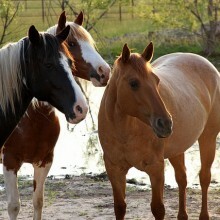 Ultimately, our goal should be to seek a physical and spiritual ONENESS with our equines. ONENESS is the most valuable item of safety equipment that we could ever own. Iain Marshall is both an actor and director. He has the BHS Horse Owner’s Certificate at level 4, a Foundation degree in Equine Behaviour and Training and a BSc (Hons) in Equitation. Currently he is researching horse/human relationships, using heart rate as an objective measure, as part of his Research Masters Degree programme, at Duchy College and Plymouth University. He has practiced both Zen and Tibetan Buddhism and has a level 2 certificate in Reiki. He lives in Cornwall in the UK with his family, his horses and a host of other animal friends.